The weather has been pretty good for baby trees lately. While I’m worried about the persimmon (Diospyros virginiana) that I planted, and the red mulberry (Morus rubra) that I planted last year is almost certainly dead, the baby pawpaws? They are growing like gangbusters. Also thriving are the trash pines (I really need to thin them) and the sassafras is doing spectactularly this year, for reals. Where oh where oh where is Andrea? It’s got the same tune as “Ten Little Indians” and it’s the sort of repetitive song that little kids like to sing endlessly to drive their parents nuts but for me it is warm fuzzy memories of getting to spend the night with my grandmother. All right, fine, they’re not huge yet, so here are some individual pictures. Please keep in mind that healthy leaves on a pawpaw look all floppy and wilted. 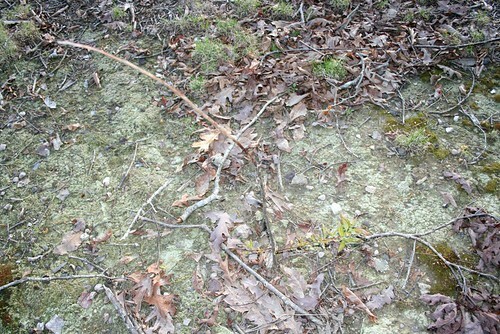 That’s the one I planted last year, and it looks as if it’s opting for the “shrub” version of pawpaw growth patterns. I’m OK with that, just as long as it doesn’t die. 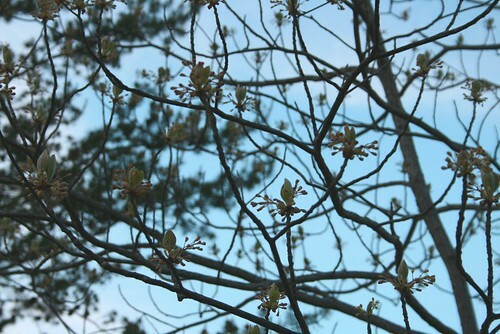 Then there’s the baby sassafras trees, which I deeply adore as their little leaf clusters look like green rose buds. 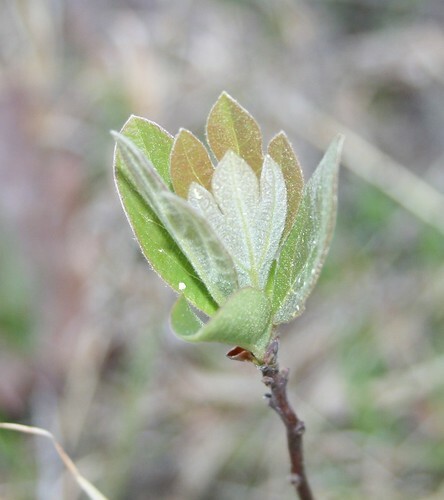 Also you never know what kind of leaves you’re going to get from a sassafras tree, they come in solid, “mitten”, and trefoil shapes, often in the same leaf cluster. If you happen to bruise their leaves (which I try not to do on the babies) then the sweet smell of root beer wafts into the air. Before the link between safrole (the aromatic oil the tree produces) and liver cancer was discovered (although it is disputed by some), the roots of the sassafras tree where what gave Root Beer its name. 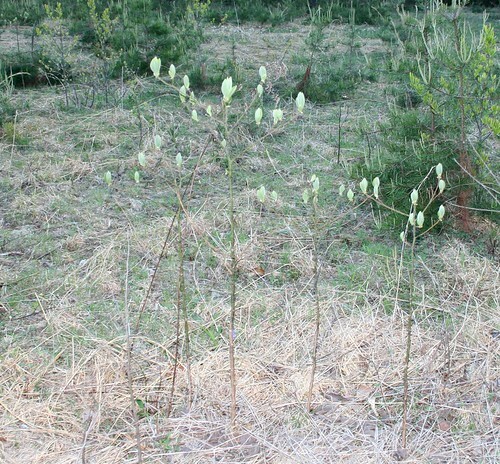 There’s a saying in the south, used to refer to land exhausted by farming or other maltreatment: too poor to grow sassafras. 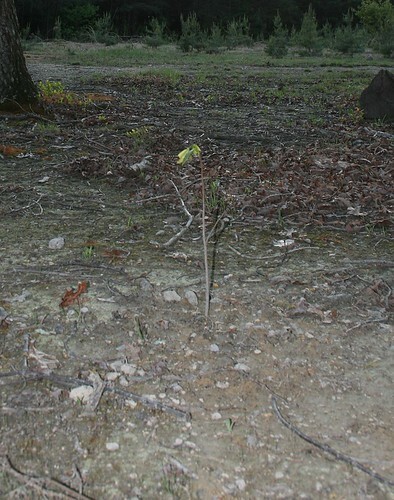 Sassafras grows anywhere, and is often the first tree to move in when land is clear-cut. 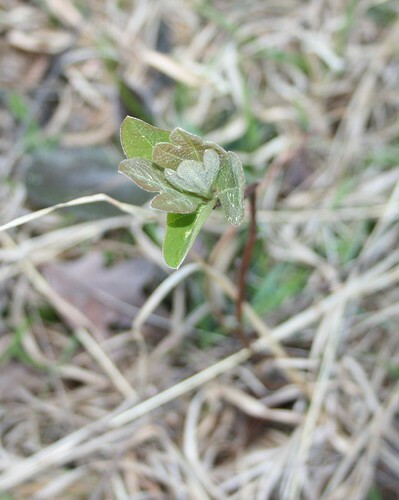 If your land is too poor to grow sassafras, you are in deep trouble. 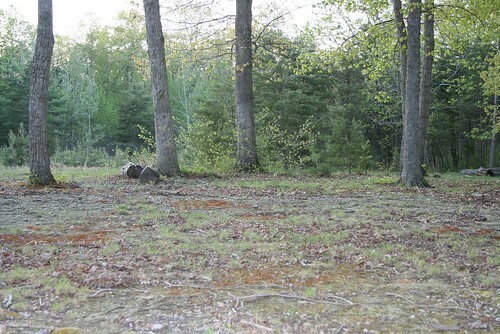 So it gives me a little thrill to see that the back acre, though damaged and blighted, is at least not too poor to grow sassafras. 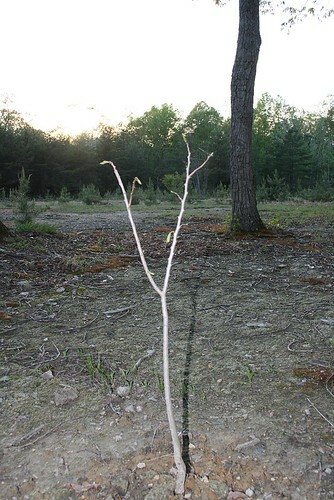 Get on with your bad selves, little trees. 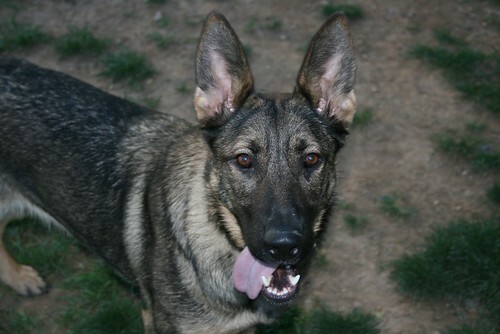 Oh and because a) I can’t possibly walk around my massive 2.5 acre property without a bodyguard and b) she needs the practice standing still while I take pictures, Zille came along. I think she had fun. I love, Love, LOVE the sassafras tree! 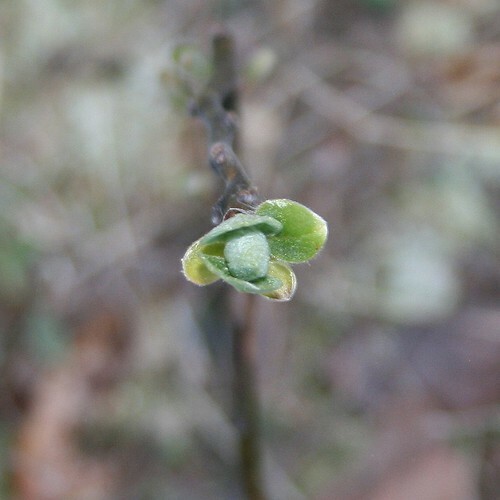 I wish I could share a mulberry seedling with you–they grow here in NE like weeds. I usually see fruit that is red or black; the next time I come across some of the red berries I’ll harvest them and ship them off to you! Take Zille. She needs the work and is mostly good. Besides. She’s not gone as much as Tink. She needs more cookies on her side of the basket to even up the scales. Have you considered putting a sign on Tink when you take her places, to help people from startling her or over reacting if they do startle her? Like, a jacket that says ‘Blind Dog’ or something?